Stats for ASK AN ENGINEER @adafruit our weekly live electronics show 12/22/2016 #makerbusiness #metrics « Adafruit Industries – Makers, hackers, artists, designers and engineers! Ask an engineer, our weekly live 1 hour electronics show that celebrates women engineers, makers, STEM/STEaM, teaches, shares … that we’ve been doing for about 8 years usually gets about 600 total live viewers over the course of the 1 hour show on YouTube, on our YouTube channel http://www.youtube.com/adafruit/ according to YouTube usually around 17,000 “watch time” (minutes) for our weekly show. As of today we have 200,163 subscribers and 32,694,532 views. After the live video was archived and posted for viewing at any time, it so far has 1,141 views as of 11am 12/22/2016, over time that increases since more people at any time will watch the archive, many of our videos have views in the hundreds of thousands! 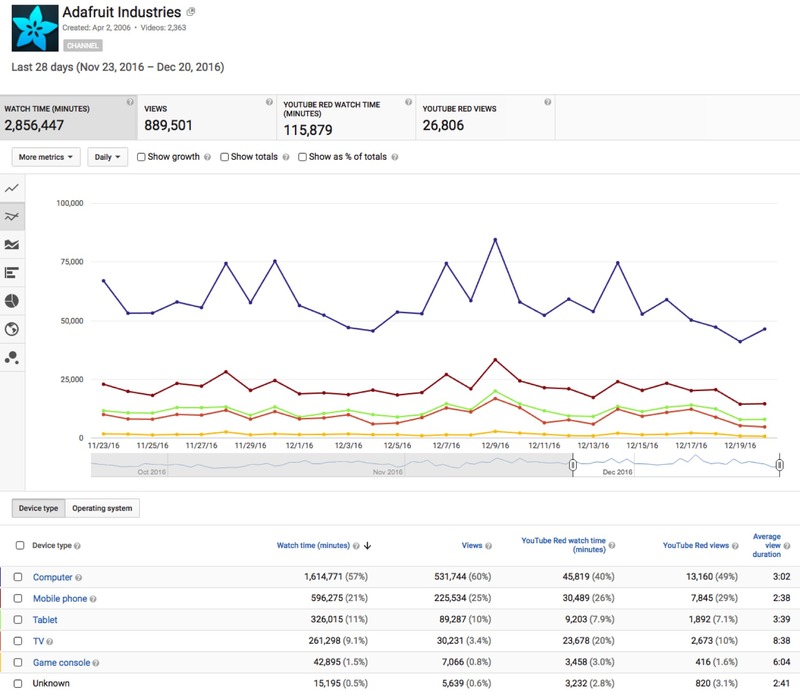 As far as what “devices” are used to watch the YouTube videos, stats pictured above from the last 28 days. 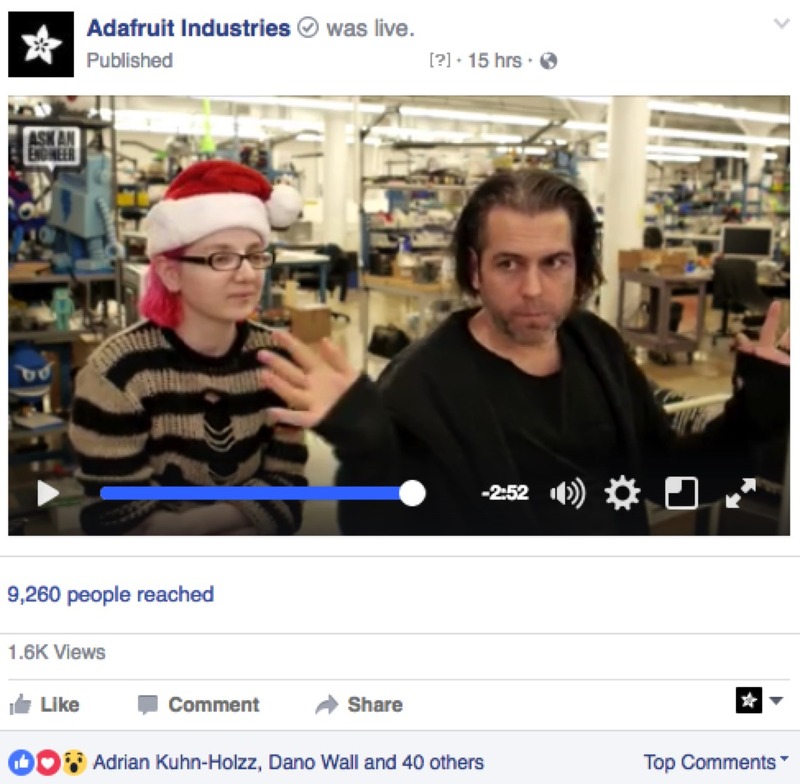 Next up, our LIVE show on Facebook live on company page https://www.facebook.com/adafruitindustries/ – according to Facebook, our live show “reached” 9,179 people and so far as of 11am 12/22/2016 1,600 views. Moving right along, Twitch.tv – on Twitch.tv/adafruit – during the live show we have over 100 live viewers at peak, however, after the show archives Twitch says there are now “2” views. When we use the Twitch “dashboard stats” it gives an error. Periscope/Twitter is next, “live” viewers for the show were 576, and now that it’s archived, it says 1,000 viewers. Likely the live viewers, plus the new views now. 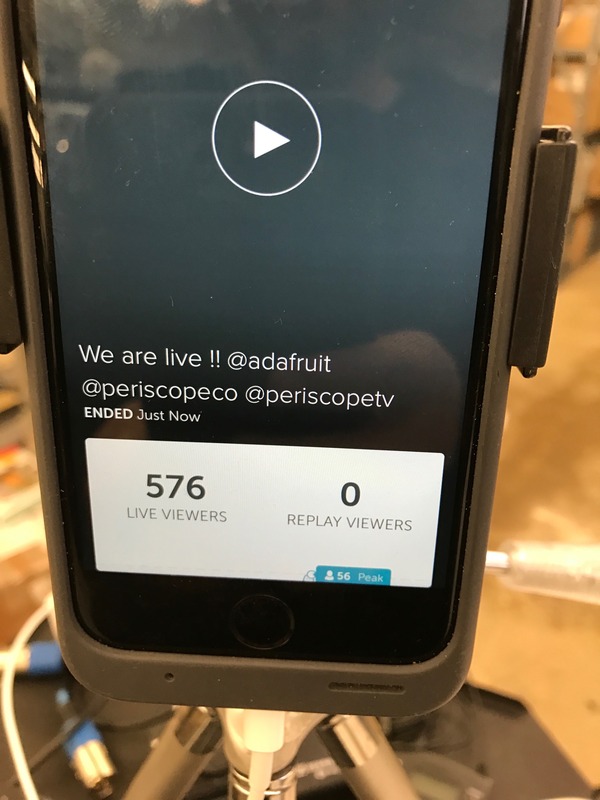 https://www.periscope.tv/adafruit/ says we have 7,701 followers and 140,510 hearts, however on Twitter.com/adafruit we have 117,000 followers. New to the broadcasts, Instagram LIVE, it only is live, does not store/archive and it’s only for 1 hour, max. 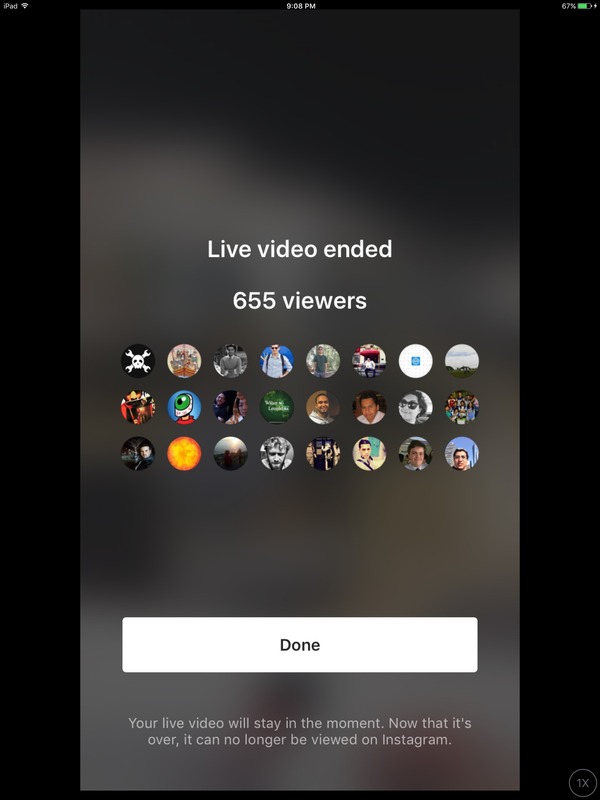 We had 655 live viewers. https://www.instagram.com/adafruit/ our Instagram Adafruit account has 44,7000 followers at this time. 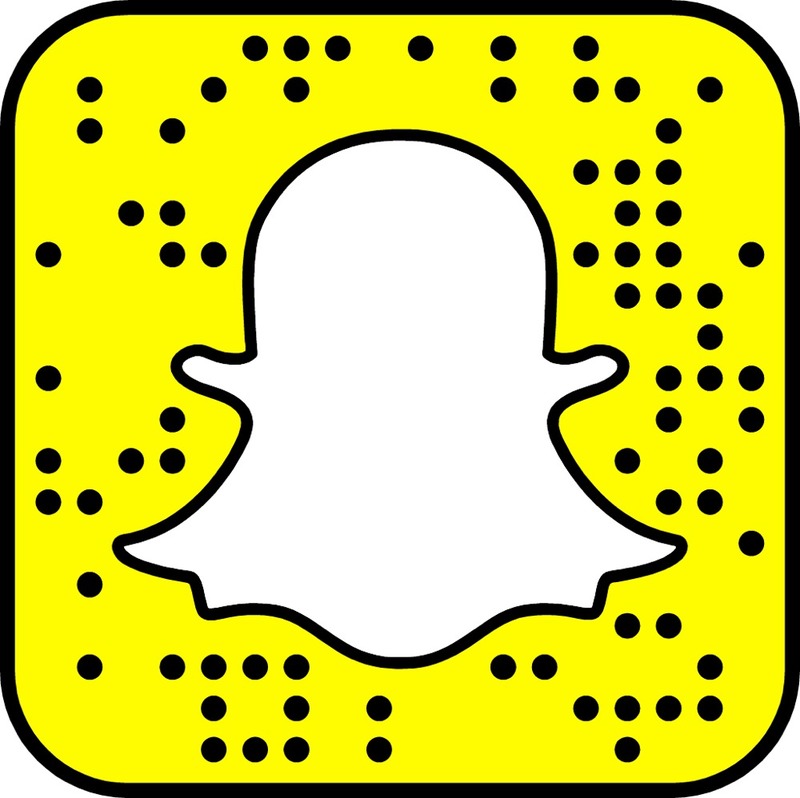 And lastly, sorta, SnapChat – We are ADABOT on SnapChat ADD US!. 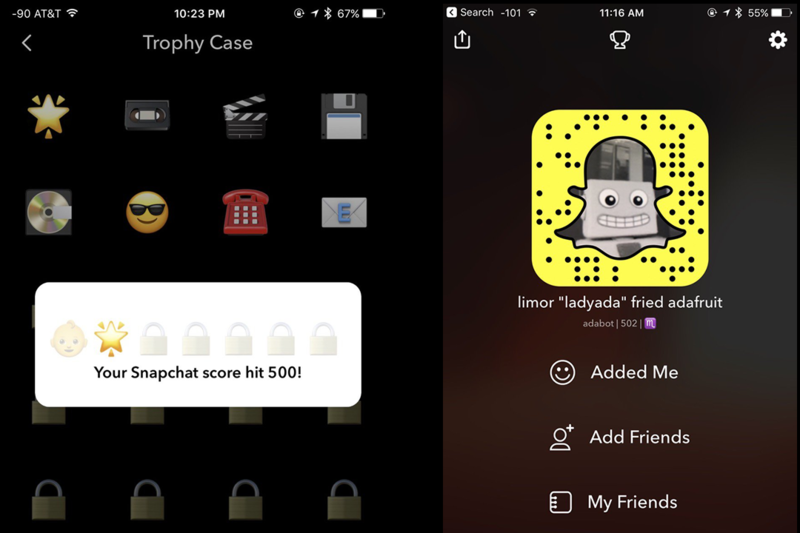 Take the highest number of views you get on your Snapchat Stories, and then multiply that by two-thirds. The resulting number represents your estimated amount of followers on Snapchat. Missing from the list Ustream, we used it for years, IBM purchased Ustream almost a year ago, it hasn’t really consistently worked since. 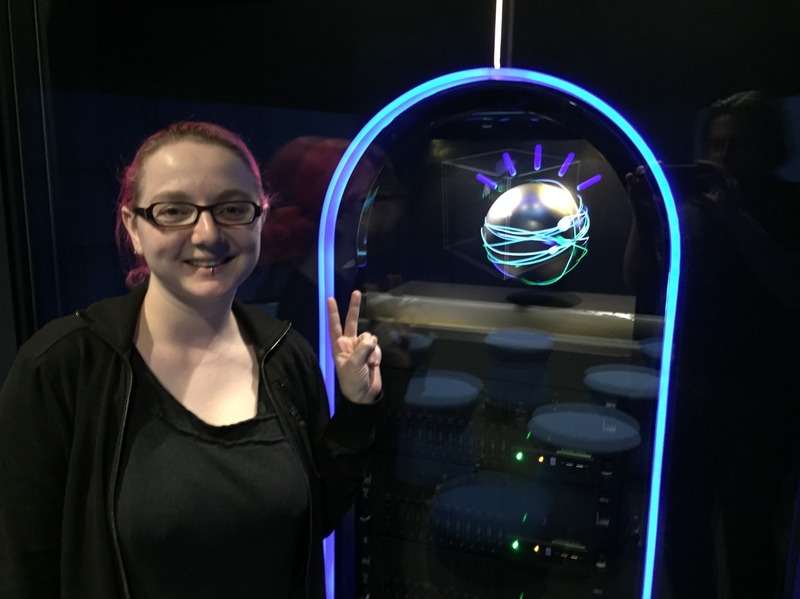 Ladyada met Watson once, but Watson cannot communicate in any way from what the IBM executive told us when we wanted to speak or type a question to Watson at the IBM HQ in NYC, they said we would have had to go to the data center in Texas. If we get a chance to “talk” to Watson, we’ve very much like to ask about Ustream, it was how we streamed for years, it would be good to use it again, we have some ideas. The most recent stats about Adafruit and our shows can be found in the about section http://www.adafruit.com/about and in PDF format (PDF 01, PDF 02). We update these every month. A few other odds and end to wrap this up, Vimeo does not have a live streaming option, so we do not use that, we do use Vimeo for “storage” of our videos, just like we use Flickr for photo storage. KickStarter added “live” to their site, so creators can do live videos for their backers, that was a good idea, we do not do KickStarters, but wanted to mention it’s a really good idea for creators to show, live, what they’re doing, progress and more.